In a March Freeze, the Wild's currently looking to snap its first three-game regulation losing streak of the season (the Wild went 0-1-2 earlier this season) and avoid its first four-game losing streak of the season. Front end of a back-to-back as the Wild looks to sweep the season series tomorrow afternoon in Winnipeg against the rested Jets. Darcy Kuemper likely starts. Tough opponent tonight in the New York Rangers (6 p.m. puck drop). Yes, they played last night at home during a shootout loss to Florida, but they're the best road team in the NHL at 25-9, have won six of their past seven and 10 of their past 12 on the road and are 9-3 in the second of back-to-backs. Since Dec. 22, 2015, the Rangers are 36-9-2 in the game following a loss and 19-5-2 this season. Devan Dubnyk vs. we think Antti Raanta, who, yes, played last night but is backed up by Magnus Hellberg, who has one short appearance this season. Raanta is 10-2 on the road with a 2.08 goals-against average and .934 save percentage. Dubnyk, 2-6 in his past nine starts, is still looking for his career-high 37th win, which would tie Niklas Backstrom's team record. In Dubnyk's first 27 games, he was 18-6-3 and led the NHL with a 1.58 goals-against average and .947 save percentage. In Dubnyk's past 29 games, he is 18-10 with a 2.65 goals-against average and .912 save percentage. In that span, he ranks tied for 21st in GAA among goalies with at least 12 games and 26th in SV%. Martin Hanzal, who missed the past three games with strep throat, and injured defensemen Christian Folin and Gustav Olofsson all took part in today's morning skate. Folin and Olofsson should be back within the week, coach Bruce Boudreau said. Hanzal, who skated with Andy Ness yesterday, said he's playing as far as he's concerned. That means Tyler Graovac would sit if Hanzal can play. Jordan Schroeder's in for Ryan White, a healthy scratch for the first time since coming from Arizona. He had a sub-par road trip in my opinion with the much publicized quitting on the play in Chicago and the penalty that led to a goal in Raleigh after he coughed up the puck twice on one shift. "I just think it’s the consistency," Boudreau said of White. "There’s some games that we come in, we’ve seen him and ‘man this guy’s great’ and there’s other games we go, ‘oh man, what happened to him?’ But I told him, today has nothing to do with the way he’s been playing since being brought out. We just wanted more speed in the lineup." I'd think Boudreau eases Hanzal in on the fourth line after not playing or practicing in eight days. So I'd guess he skates with Chris Stewart and Schroeder or Jason Pominville, who has not been good the past two games. The Zach Parise-Erik Haula-Pominville line hasn't been good, so my guess is the first and third lines are scrambled and maybe even the Mikko Koivu line because they just haven't been generating a lot lately. I do wonder when they maybe try Parise with Koivu and Mikael Granlund. Eric Staal plays 999 tonight against brother Marc after playing 998 against brother Jordan. He said he told Jordan after the game the three of them all need to pinch themselves for playing in this league so long. Hanzal said he started to feel sick during the third period of the Florida game. He said yesterday skating for the first time, "I was a little low on energy. I felt better today. I'll be OK tonight." Hanzal said, "It's always tough to miss games. I'm on a new team so I'm trying to fit in and learn the system and everything around it. It's been tough. It's been a tough week for me." Boudreau said it was bad timing for Hanzal getting sick because he played so well in the win vs. the Panthers. "He was definitely a beast that game, for want of a better term," Boudreau said. "That was his best game and unfortunately he got sick the next day." Boudreau believes the Wild will fight itself out of this funk. As I wrote today here, the month of March has been ghastly, and there's a bunch of numbers in here to serve as evidence. "Yeah we’ve gone through a little bit in the last 10 days," Boudreau said. "I’m very confident that this team, whether it’s tonight, whether it’s tomorrow or whether it’s the next day is going to come out of this and we’re going to be a better team for it." The Wild plays four of its next five at home starting with the front end of a back-to-back (Sunday’s game is at Winnipeg). The Wild beat the Rangers in Manhattan, 7-4, on Dec. 23 but is 0-5 in its past five games against the Metro Division. The Rangers are 4-5-1 in their past 10. The Wild is 5-3 in its past eight games against the Rangers in St. Paul, with four of those games decided by one goal. Mikael Granlund’s 65 points are tied for eighth-most in a Wild season. Charlie Coyle, who had a goal and three assists against the Rangers in December, has one empty-net goal in the past 14 games. Matt Dumba has taken seven minor penalties in his past seven games and leads the Wild with 21. "I think sometimes it’s trying too hard," Boudreau said of Dumba. "And what I mean by that is you get yourself out of position by jumping into the play and when you’re playing from behind a lot, which we’ve been the last two weeks, you end up having to skate back and you get caught doing things that you’re not supposed to do." 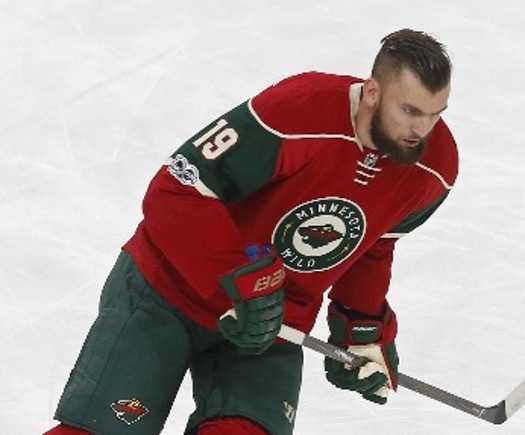 The Wild has held a lead for 12 minutes, 40 seconds out 360 minutes in the past six games (1-5). The Wild has allowed the first goal in nine of the past 11 games; the Rangers are 29-11-2 when scoring first. Since Jan. 7, 18 of the Rangers’ 30 games have been decided by one goal. The Rangers have earned at least one point in 13 of the last 15 games they have played which were decided by one goal (11-2-2).